I hear there were a couple of celebrations in the USA this week. Considering over half my lovely followers are American, I thought I had to mention them. So on Tuesday there was this little celebration, you may or may not have heard of it, it’s usually accompanied by a few sparklers, nothing big. It’s called Independence Day. Heard of it? I know, probably flew under your radar. Then today there is probably THE most important day on the American calendar. It’s a huge celebration of national importance. Yes, of course, I’m talking about none other than National Chocolate Day. I knew you would have heard about that one and be celebrating as we speak. 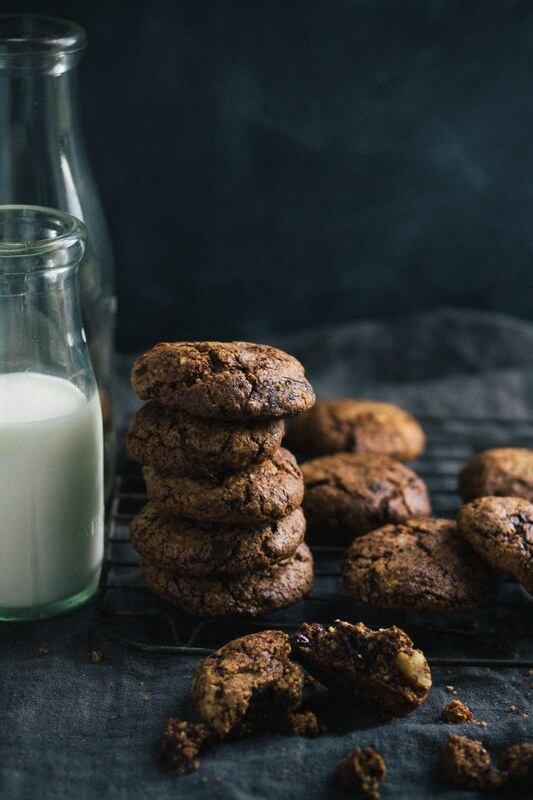 What better way to celebrate than with THE most luxurious cookies, a.k.a. 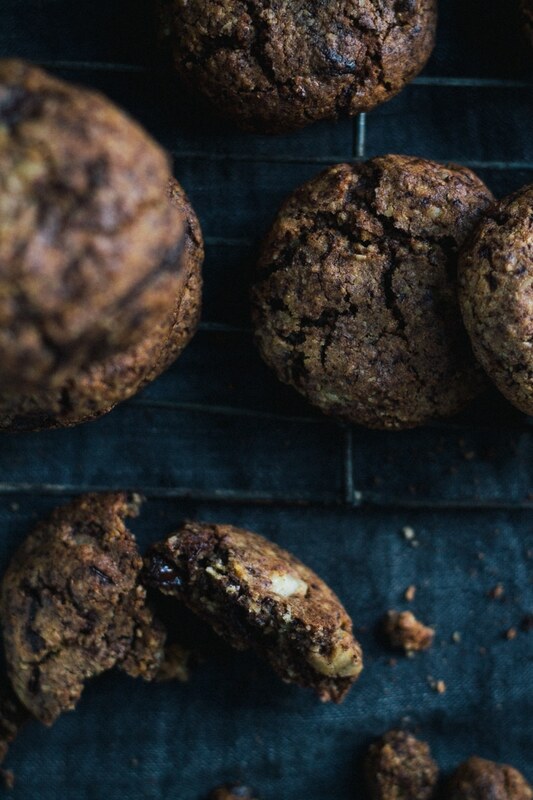 my Luxury Dark Chocolate and Nut Cookies. How luxurious? Well, for starters there is almost 1/2 a kilo (one pound) of chocolate in these. No holding back there! One and a half cups of nuts and A LOT of butter. They are so luxurious that if Gucci sold cookies then this would be it. Actually, more to the point if Neiman Marcus (for all you non-Americans like myself, it’s a high end department store in the States) sold cookies then this would be it. Funny I should mention it because they do, and what a coincidence, this IS it. I have been making these cookies for over 10 years now. Initially I used to bring them out at flat parties and now they are more likely to make appearances at kid’s play dates. Either way they have always been a hit. I have no idea where I got the original recipe from but it was such a goodie that I have barely adapted it over the years. It’s only been recently when I’ve been poking around on the internet that I found out that these are in fact the famous Neiman Marcus cookies. Who would have known? Rumour has it that they are so good and the recipe was so sought after that someone paid $250 for it. I think it was just that, a rumour, but a good story nonetheless. 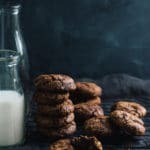 What makes these cookies so good? Well the chocolate, duh! Even my one year old has that question nailed. 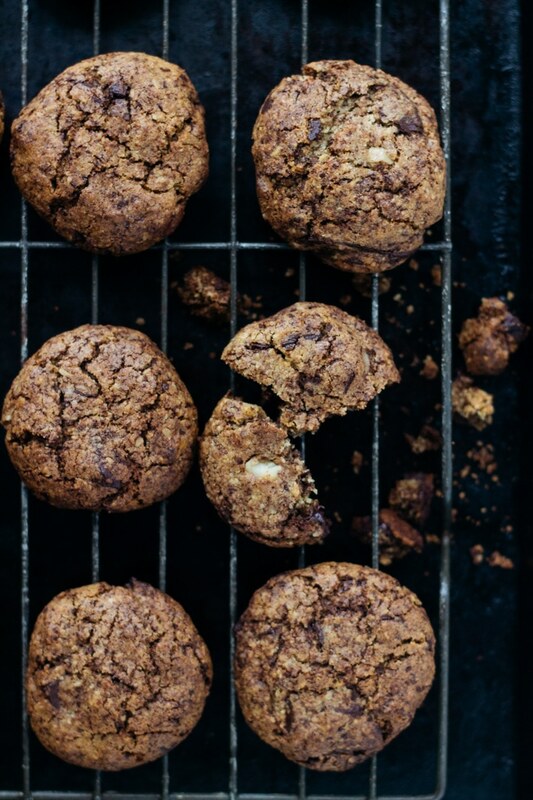 It’s not just the fact there’s so much chocolate in them, but a whole lot of it is grated into the cookies. That’s what makes them so good. That contrasted with decadent nuts, and my little adaption, to have big chunks of chocolate rather than chips, but if chips float your boat go right ahead. 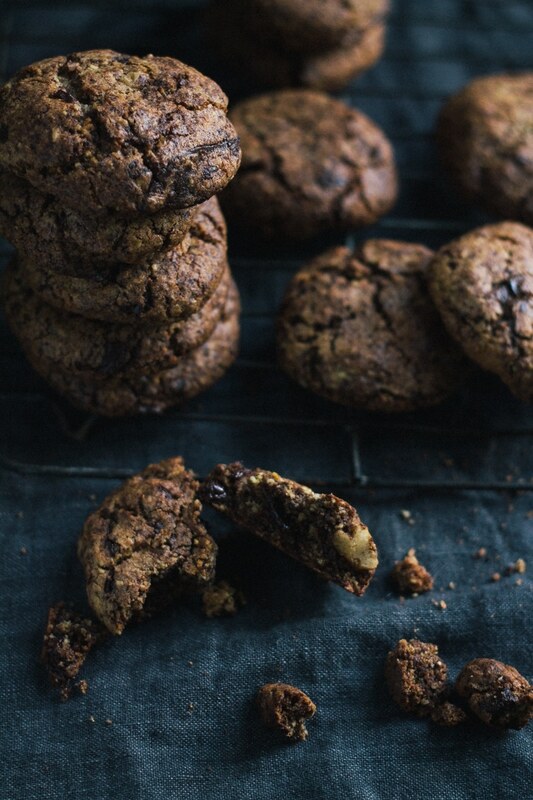 The recipe for Luxury Dark Chocolate Nut Cookies makes a ginormous amount of cookies. Do you have a problem with too many cookies? I don’t. Well, just in case you do you can roll the cookie dough into balls, flatten and pop them on a baking tray like you would before they go into the oven, but instead throw them into the freezer tray and all. Once they are frozen, transfer them to a bag and pop them back into the freezer for up to three months. Now, whenever the mood strikes, or you have an unexpected visit from the in laws, a play date or possibly a house party(?) then all you need to do is put them into the oven, bake them for an extra 2 min and there you have it. Fast food cookies. Happy National Chocolate Day! Can’t wait for the day New Zealand adopts this glorious day. P.S. Happy Independence Day to all you lovely Americans. I hope you had a fantastic day celebrating freedom. I was only joking before (wink). P.P.S. It does take some time to roll out all of the cookies, but I find the best way to do this is to turn on the radio, grab a coffee (or wine), set aside some cookie dough (this is your sustenance to get you through all that rolling, who doesn’t like raw cookie dough) and get rolling. If it’s just me at home on the weekend or the kids have gone to bed, then it’s quite relaxing I find. Preheat oven to 190C/375F on fan bake. Line a baking tray with baking (parchment) paper. Weigh chocolate and divide into two lots: one of 340g/12oz and one of 125g/4.4oz. Roughly chop 340g/12oz into roughly chocolate chip size chunks (some larger if you like). Set aside. Using a box grater, grate 125g/4.4oz and set aside. Place rolled oats in a food processor and blend into a fine powder. Add plain flour, wholemeal flour, baking powder, baking soda and salt and pulse a few times to combine. Set aside. In the bowl of a standing electric mixer fitted with a paddle attachment, cream together the butter and sugar until pale and fluffy, 5 min. Add the eggs one at a time ensuring they are fully incorporated after each addition. If the mixture looks like it has curdled add a tablespoon of the dry ingredients. Add the vanilla and beat to combine. Reduce the mixer speed to low and add the flour mixture and grated chocolate. Beat until just combined. 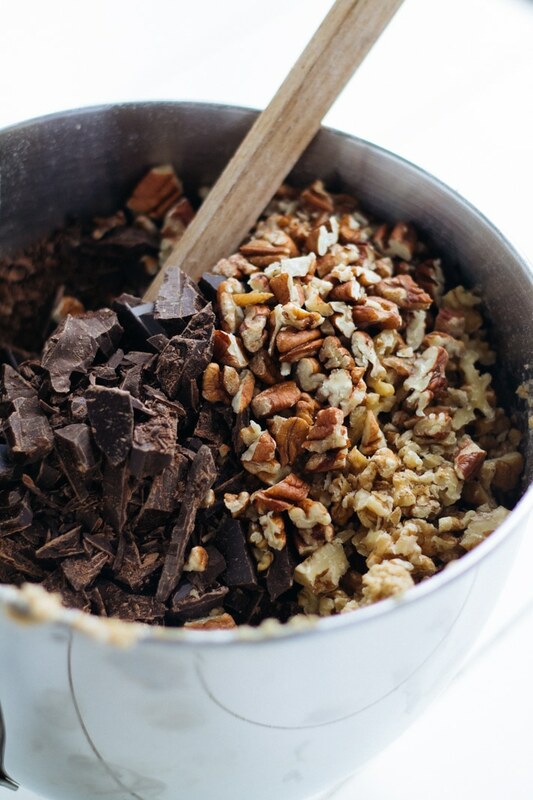 Remove bowl from the electric mixer and fold in chocolate chunks and chopped nuts. Using your hands, roll mixture into small balls, about 2 tablespoons in size, press down and place on the baking tray approximately 5cm/2in apart. Bake in the oven for 8-10 min until the edges are baked but the middle is still slightly undercooked. Remove from oven, allow to cool slightly before transferring to a wire rack to cool completely. Repeat with remaining dough. 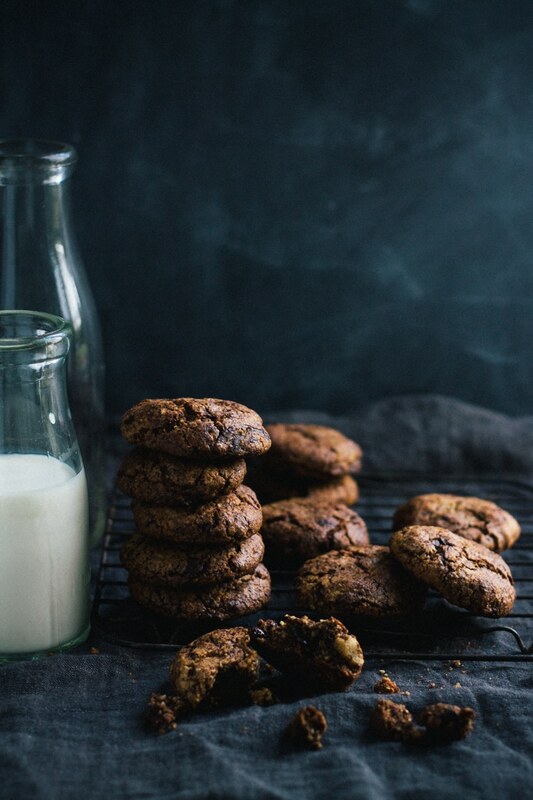 Cookies can be stored in an air tight container for up to 5 days. Alternatively, you can roll the dough into balls, press down gently, and place on a baking tray and freeze. Once frozen, transfer to a container and store in the freezer for up to 3 months. 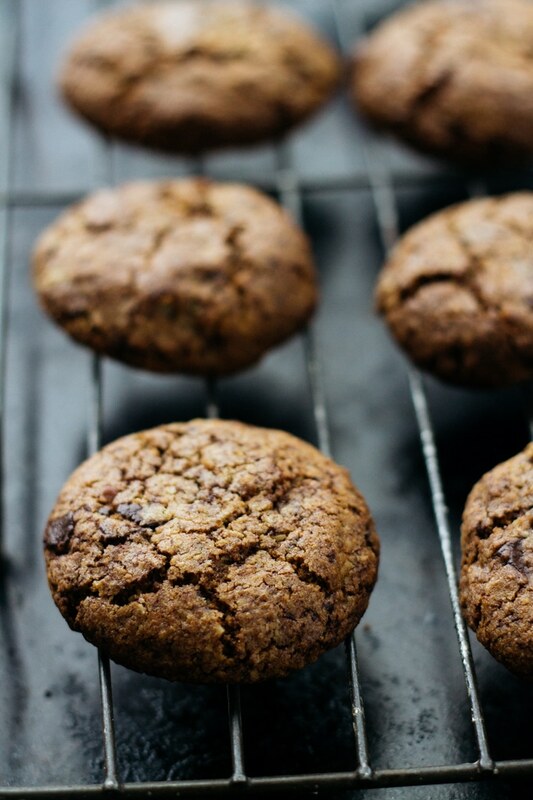 To bake, simply place frozen cookies on a baking sheet and bake according to the instructions above but for 10-12 minutes instead. If you make this, I would love to see! Tag your photo with #mylittlelarder on Instagram or Facebook.